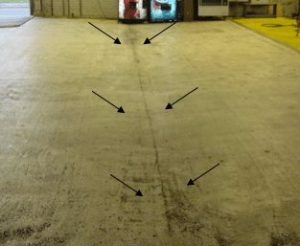 Poor soil compaction from construction resulted in a slow, steady dropping of the automotive service center receiving ramp floor. The floor was on grade at the edges, but the center had dropped four inches. This resulted in a safety hazard for customers as well as reducing the professional visual presentation that the automotive dealership wanted to convey. 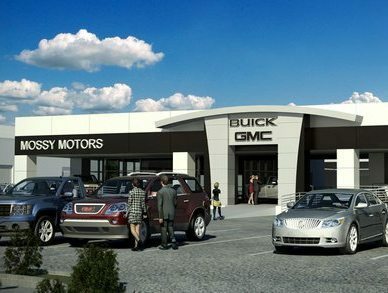 Mossy Motors did not want to interrupt the most profitable part of their dealership – their service area. As such, a solution was sought that would not interrupt their business flow. 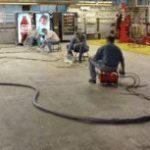 Second, there was no desire to completely replace the floor because of the time, cost, and disruption to the service area it would cause. The void fill & stabilization was performed with the assistance of lasers. URETEK ICR utilized the method and void filled and lifted the service ramp in a single six-hour project with no business interruption. The material and process successfully brought the service ramp back into specification and restored the visual appeal of the service drive. An additional benefit is that the URETEK 486 material used in the job has strengthened the underlying soil surface which is extending the life of the ramp while allowing it to handle greater loads than before.